In this guide to Mafia 3, we will show you how to unlock all your abilities and what they will bring you. The Perks are connected with the three underboss / assistants, with whom you will become acquainted. They are the ones who provide you with special abilities. In each district there are various special tasks to do. In doing so, you rob and kill to drive the criminals out of their districts. Once you have conquered the districts, you must assign them one of you three underbosses: Cassandra, Thomas Burke and Vito Scaletta. They do the business for you and take the money. Depending on how much money they earn, they will unlock Perks, giving you special weapons, vehicles, or health. You have to decide which special abilities you want to expand. Accordingly, you place the respective boss. Burke is your man for vehicles. If you need a specific car, Burke will deliver it to your place. If you level the Perk, you can steal and use vehicles. In addition, this underboss keeps your cops off your neck and brings you explosives. He also provides some vehicle skills that will help you get the most out of the game. Bullet-proof tires or drive upgrades. Vehicle delivery - Level 1: Vehicle delivery is enabled. - Level 2: Cars can be stolen unintentionally. - Level 3: Busy cars can be stolen unintentionally. - Level 1: Burke must be recruited. - Level 2: Burke must have earned $ 180,000. - Level 3: Burke must have earned $ 370,000. Police Officer - Level 1: Remove blue police for 30 sec. - Level 2: On the map, policemen are drawn in the vicinity. - Level 3: Remove blue police for 2 min. - Level 4: Remove blue and red police for 2 min. - Level 5: Remove blue and red police for 5 min. - Level 6: Remove blue and red police for 10 min. - Level 1: Burke must have earned $ 30,000. - Level 2: Burke must have earned $ 60,000. - Level 3: Burke must have earned $ 140,000. 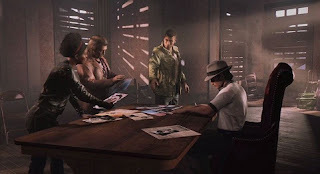 - Level 4: Burke has earned $ 220,000. - Level 5: Burke must have earned $ 320,000. IRA bombers - Level 1: Explosives can be purchased from the weapon dealer. - Level 2: You can carry more explosives and additional items - can be purchased from the weapon dealer. - Level 1: Burke must have earned $ 100,000. - Level 2: Burke has earned $ 280,000. Cassandra is an important underboss. She unlocks a weapon dealer who sells you better weapons. In addition, she has contacts with a weapon smith who will provide your weapons with upgrades. Another particular special feature is the telephone operator. Call here to lock the phone lines, so your enemies can’t call any reinforcements. She also provides you with suspension upgrades and armor for your vehicles. Telephone operator - Level 1: Telephone connections are disconnected for 2 minutes. - Level 2: Disconnect telephone connections for 5 minutes. - Level 3: In combat, phone connections are disconnected and you gain reinforcements. - Level 1: Cassandra must have earned $ 100,000. - Level 2: Cassandra must have earned $ 270,000. - Level 3: Cassandra must have earned $ 420,000. Weapon traders - Level 1: Unlocks mobile weapon traders. - Level 2: You can buy Scraming Zemi at the arms dealer. - Level 3: Screaming Zemi also releases smoke. - Level 4: Screaming Zemi causes additional damage. - Level 1: Cassandra must be recruited. - Level 2: Cassandra must have earned $ 30,000. - Level 3: Cassandra must have earned $ 180,000. - Level 4: Cassandra must have earned $ 320,000. Weaponsmith - Level 1: Guns get a precision Uprgrade. - Level 2: Weapons receive ammunition capacity Uprgrade. - Level 3: Weapons get a Stability Uprgrade. - Level 4: Weapons load faster. - Level 1: Cassandra must have earned $ 60,000. - Level 2: Cassandra must have earned $ 140,000. - Level 3: Cassandra must have earned $ 220,000. - Level 4: Cassandra must have earned $ 370,000. Vito is a real mafioso who has relationships with bankers, doctors and dodgy types. If you unlock your special abilities, you can call for reinforcements or boost your health. Consultant - Level 1: You can partly hide your money. - Level 2: You can locate enemies and accept bribes. - Level 1: Vito must be recruited. - Level 2: Vito must have earned $ 140,000. Mafia doctor - Level 1: You receive another health bar. - Level 2: You can wear an additional adrenal injection. - Level 3: Your health and endurance regenerates faster. - Level 4: You receive another health bar. - Level 6: You have the maximum health. - Level 1: Vito must have earned $ 60,000. - Level 2: Vito must have earned $ 100,000. - Level 3: Vito must have earned $ 180,000. - Level 4: Vito has earned $ 270,000. - Level 5: Vito must have earned $ 320,000. - Level 6: Vito must have earned $ 420,000. Racket - Level 1: You can call armed reinforcements. - Level 2: You can call heavily armed reinforcements. - Level 3: You can call 4 killers to gain. - Level 1: Vito must have earned $ 30,000. - Level 2: Vito must have earned $ 220,000. - Level 3: Vito must have earned $ 370,000.